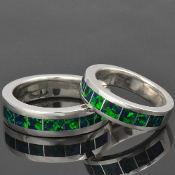 Hileman Silver Jewelry is proud to offer our lab created opal wedding ring sets as an affordable and beautiful alternative to Australian opal. 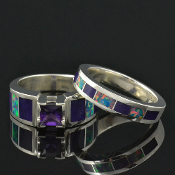 Hileman lab created opal wedding rings are inlaid with top quality lab opal in a variety of opal color options. We take great care in selecting and cutting the lab created opal to mimic the random fire and patterns in natural opal and to minimize the uniformity common to other laboratory grown opal ring manufacturers. All of our opal wedding ring sets are available in his and hers, hers and hers, and his and his wedding set combinations. Our lab opal wedding rings are available in sterling silver, Continuum sterling silver, 316L stainless steel, gold and platinum for an additional charge. 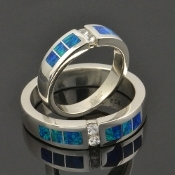 Matching handmade his and hers sterling silver wedding ring set inlaid with Australian opal accented by white sapphires. Beautiful inlaid blue-green Australian opal surrounds two round brilliant cut white sapphires in each of these unique inlay bands. We also have an entire website dedicated to lab created opal jewelry. Stop by and see all our lab opal jewelry creations!